Sundays are days designed for many things – pyjamas, roast dinners, brush-washing and a skincare pamper. My skin always benefits from a Sunday facial (and the extra time I have), and it leaves my face all prepped for the week ahead. 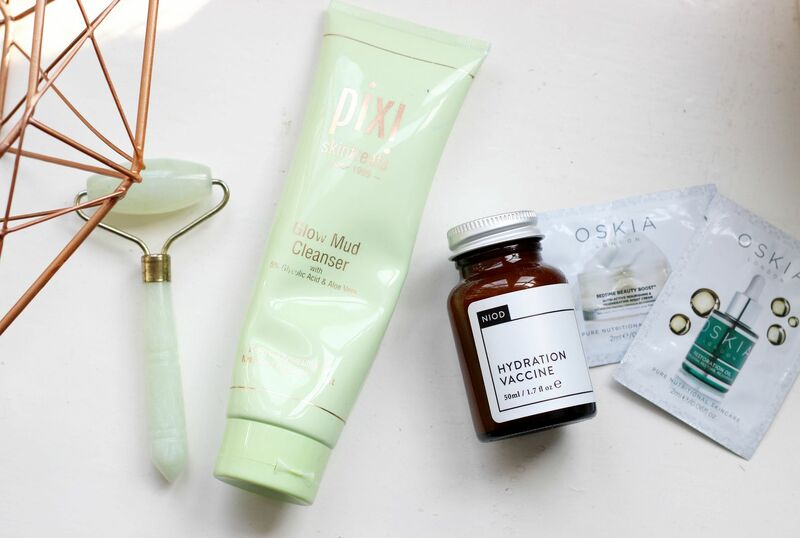 My favourite cleanser of the moment is the Pixi glow mud cleanser – it has a really unusual texture for a cleanser in that it feels quite solid. I find it works best as the second cleanse when skin is a little damp already as this gives it more slip so it doesn’t drag on the skin. It feels amazing though, and leaves my face so so smooth without being drying. Without a doubt, one of my favourite products is the Jade roller – I use it everyday, and it’s one of those items that feels like a real treat for the skin. I pay extra attention to the jawline to try and make sure my skin isn’t congested. Ahhh, it’s just so nice and cooling. If I’m giving myself a proper facial then I always use this, and make sure any facial oil is worked in perfectly into the skin. To finish everything off, I’ve been enjoying the Niod Hydration vaccine to give my skin an extra boost. To be honest, my skin could always do with a special boost of hydration so this is perfect for me. It’s one step up from a serum but one down from a moisturiser, and works well to leave my skin especially smooth – almost like a seal to maintain any hydration. Clever stuff.